Barnaby is a collector of seeds and a non-conformist. Regardless of the Mayor’s order that no one is to grow anything in Bunnyville, Barnaby dreams of planting his seeds and creating an abundance of fresh vegetables for the village. Clever and resourceful Barnaby won’t be deterred. He must find a way around the Mayor’s instructions, if he is to fulfil his dream. 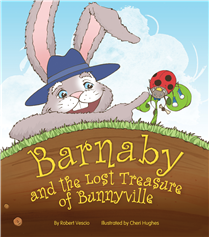 Barnaby’s ingenious plan begins with a treasure map that finds its way into the Mayor’s path, who then orders the bunnies to search and find the treasure. Holes are dug. Perfect for Barnaby’s seeds waiting to be planted. Can Barnaby’s plan succeed? What will the outcome be? This happy-ending story with an environmental theme is designed to educate children about where their food comes from, and show them how easy it is to grow things. This is reinforced by the bold, coloured illustrations, the joy the other bunnies experience at the sight of delicious, fresh food, and the acceptance from the Mayor of Barnaby’s determination. The metaphor of fresh food being a lost treasure waiting to be discovered is fantastic. Young children will love the bunny cast, and the characters will help impress the message the story carries on readers. I see a wonderful game of seek-and-find being initiated as children learn the names of the fruit and vegetables pictured on the end papers. This will encourage them to taste new things. Imagine the possibilities!